As the CEA-Euratom tokamak Tore Supra undergoes a major transformation to be used as a test bench for ITER, its innards are being progressively disassembled. From huge heating antennas to the intricate network of piping that used to cool the limiteur (Tore Supra's equivalent of a divertor), most of the in-vessel components are now carefully wrapped and stored in an annex of the vast tokamak hall—a spectacular indication of how complex a machine a tokamak can be. Four years from now, the 26-year-old tokamak will be a brand new machine. Extra magnetic coils will be added to confine the originally circular plasma into an ITER-like "D" shape and the carbon limiteur will be replaced by a tungsten divertor closely resembling that of ITER. However, in advance of that date (as early as 2016) the machine will be ready to test the first samples of plasma-facing units—an arrangement of small tungsten blocks that, once assembled, will form the new divertor. 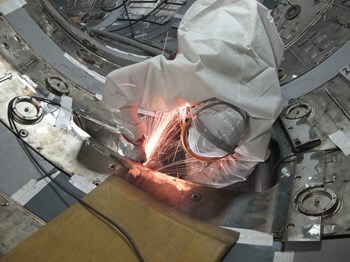 The WEST project (W Environment in Steady-state Tokamak), initiated in 2009, is now entering a decisive phase: as dismantling ends (1,500 components, representing 65 tons of hardware, have been handled), industry is beginning to launch pre-series fabrication and a wide international collaboration is being established. "With this new configuration, the machine's divertor will be exposed to the same heat flux as in ITER," explains Jérôme Bucalossi, who heads the WEST project at CEA's Institut de Recherche sur la Fusion Magnétique (IRFM). Like in ITER, the WEST divertor will have to withstand a 10 MW/m2 heat load, comparable to that which an improbable spaceship would face in the immediate vicinity of the Sun's surface. How will the tungsten plasma-facing units behave in such an extreme environment? How close to one another should they be assembled? What will be the consequences of a slight misalignment of the individual blocks? WEST should answer these questions that are of vital importance for ITER. "WEST is more than a test bench for the ITER divertor—it's a 'risk limiter' as well," says Bucalossi. "It will enable us to validate tungsten technology, acquire data on metal fatigue and explore the components' boundary conditions, particularly in terms of adjustment." Although the design of the ITER divertor is close to finalization, WEST feedback can still have influence on some details. "And as we all know," smiles Bucalossi, "this is where the Devil likes to hide..."
Click here to view a video presenting the WEST project.